I've become an iced tea addict over the last year or so. It used to be I'd just drink it when we were driving to San Francisco. Then last summer (or was it the summer before that?) I started drinking it pretty much every day. I like to use the large plastic cups with cover and straw that the various fast food places serve beverages in. I'd use them over and over- washing them every now and then- until they got so grungy I'd throw them in the recycle bin and go get another cup from some fast food place. My favorite is the Shell mini- market in Cloverdale where they'll sell you as many of their "Double Gulp" cups as you'd like for only 25 cents each. I'd also stop at either Burger King or Taco Bell in Eureka, buy a large iced tea, and use the cup over and over. Yesterday I decided the large cup I'd bought from Burger King a month or so ago needed to be replaced. I was going by City Garbage anyway, and figured it wouldn't be too far out of the way to stop by the Taco Bell on Broadway and buy a large iced tea. I was to be greatly disappointed. I went in, asked for a large iced tea, and the girl tells me they only offer sweetened iced tea now. Unsweetened is no longer an option. WHAT??? I only like it unsweetened. How rude! So I tell the gal I really just wanted one of the large cups and offered to pay 25 cents just for a large cup, lid and straw. She seemed a bit unsure of how to handle that so simply offered to sell me a glass of water that only cost 11 cents, with cup. Except the cup seemed to be the medium size rather than the large one I wanted. What the heck. I'm easy. I gave her 25 cents for my medium glass of water and told her to keep the change. The cup was important, but not that big a deal. How dare they stop offering unsweetened iced tea? We'd nearly always stop at Taco Bell before leaving town to head south for my obligatory large iced tea. I guess no more. They better not be doing that at Burger King. And it will be an even worse nightmare if the Cloverdale mini- mart stops offering plain iced tea. The story of my life: I like something, but nobody else does so it's discontinued. The Santa Rosa Press- Democrat has a nice piece on asset forfeiture. That's law enforcement seizing assets such as cash and cars they believe were used in crime. I'm getting the impression it's just me that has a problem with the Times- Standard's web site. I've never heard of anyone else having the same problem. It's actually not just the T-S web site. I've noticed lately that all the news sites run by the T-S parent company, Media News Group, mess up my computer to some extent. The T-S web site seems the worst and I'll have to spend five minutes or more just to see if there is any news worth reading. If I'm there more than a minute or so I'll hear my CPU start rattling and it doesn't stop. The screen pretty much freezes. After a minute or two...or three, I'll get a message telling me the Shockwave Flash player is busy or stopped working. At least a couple times I've had a strange window open saying Shockwave has crashed. That's almost a good thing since it makes it easier to escape the site. Yesterday I decided I need to figure out what's wrong so did a quick Google for Shockwave Flash problems. I found a few others had the same issues. The answer seems to be uninstalling Shockwave Flash and reinstalling it. I found the instructions here, although I was a bit leery at first it might be trying to get me to install malware. Looks legit, though, since it seems to be a Shockwave web site. I'm going to try it before I check the T-S web site this morning and see if it works. Any suggestions are welcome. If you don't hear back from me, maybe I ruined the computer trying to fix it. At least I think the test is the same one Pew Research used to analyze the political landscape. It seems to work contrary to the title of the Huffington Post article: America's Idealogical Splits Aren't As Simple As Left, Right and Center. The test itself seems to lean pretty much towards a linear political model. There's something like 23 questions. You only get two choices with each question. Some questions leave out some obvious choices. For instance, there's one about homosexuality where the choices are something like, "Society should encourage homosexual behavior" and, "Society should discourage homosexual behavior". The only answers are that society should involve itself one way or the other. The libertarian response would be something like, "People's sexual activity is their own personal business", but that's not given as an option. I wasn't the only one that felt the test was too limited. One comment to the article pointed out the question about involvement in foreign countries vs. taking care of things at home was a bit goofy. You have to choose one or the other, yet the two aren't necessarily mutually exclusive. I wasn't too surprised to score as a Steadfast Conservative given the questions and acceptable answers. There's something missing with the thought process that went behind the test. At least the World's Smallest Political Quiz allows three answers. The Pew test might work a little better if they'd allow Maybe, or Not sure, along with their other answers. City residents, or elected officials? Some of you may recall Eureka's water and sewer rates took a big jump a few years ago after city officials realized they weren't charging enough to replace aging infrastructure. I believe Eureka's rates were raised with simply the approval of the city council. Fresno is going through the same thing now, except some residents joined together for a referendum to stop the rate increase. Looks like they submitted enough signatures to put it on the ballot. City officials fought the referendum effort every step of the way, according to Cal Watchdog. You'd think a referendum would have been the easy way out for them. The courts disagreed and the petitioning went forward. Two questions remain: What happens if the rate increase is overturned by voters? Will the system fall apart as supporters of the rate increase claim. I haven't read any arguments by opponents that it won't. Second, you have to wonder why the city fought against the referendum to begin with? Is their case so shakey that it won't pass voter scrutiny? Seems tacky at best, corrupt at worst. After all, if voters do overturn the rate increase and the system does end up falling apart, they'd have to increase rates to fix it. There might not be anyone opposing a rate increase at that point. As it is, Fresno city officials are looking bad to even to supporters of the increase. The Eureka City Council has requested all city departments find savings in their budgets of 10%. I understand they'll be discussing the proposed city budget, including the 10% cuts, at tonight's city council meeting. Pro- Measure O tax extension advocate, Leo Sears, sent out an e-mail the other day rallying folks to go to the council meeting and voice their opposition to the across the board cuts. The reasoning being that while 10% cuts for all departments might seem fair, citizens of Eureka want law enforcement fully funded. Thus, other departments should take the back seat. It will be interesting to see who shows up to argue what at tonight's meeting. Will we be able to separate those opposed to Measure O's extension from those in support? Addendum: I try to avoid using names here of people who send me private communications. In the case of Leo Sears and the e-mail he sent out, it was sent to "undisclosed recipients", or bcc'd. Since it came via an apparent e-mail list, I figure it's fair enough to include his name. I've gotten at least one thing, and have given away a number of others on the Humboldt Craigslist Free Classifieds. I got a nice weight bench last November. I've given away all sorts of odds and ends including cassette tapes, vhs tapes and other stuff laying around I didn't need. You can get some goofy replies, though. I recall posting an ad giving away something for something free when the first reply asked if I still had "...the item for sale". Probably some troll so I didn't answer. I guess that happens fairly often. That's why people post ads like this. Apparently yet another person replied saying they wanted something but never showed up to get it. When I first started giving stuff away most came and got it pretty quick. I do recall one time where it took two days for them to come get it. What's with that? No harm done, I suppose, but I'm gonna have to get a bit pickier about who I decide to give it to. This last time I'm wondering if I've been mega- trolled? Posted an ad yesterday for some free shelving. I included a picture of what I was offering. Checked the e-mail an hour later and had three replies, all saying they wanted it. The second and third even gave phone numbers. The first just said he or she would be interested in it. As I always do (and mention in the ad), I e-mailed the first three replies telling them what order they were in. The first one gets it, normally. The first one was told they could come get it and I gave them directions. I never heard back. As of last night I hadn't heard back so figured I'd give them 'til sometime this morning. I e-mailed #2 saying I'd give it to her if #1 didn't come get it by then. #2 e-mailed me last night and said that would be fine and she could come get it on the way to work. I e-mailed her back this morning telling her #1 didn't contact me so it was hers and gave her directions to my house. She's never replied. She said she'd be here by 10am but she hasn't shown up. Is this another troll? Her e-mails don't read like it. I guess I'll let the shelving sit on the front lawn until tomorrow. Things happen. Maybe she couldn't make it? Then maybe I'll call, instead of e-mail #3 if I don't hear from #2 again. I'm thinking of changing the way I handle those ads. I usually state if they're among the first 3 responses they'll be notified. If they don't hear from me, they're not in the top three. Maybe from now on I'll e-mail the first 3 or 5 and offer it to the first one that replies and says they'll come get it? I can't think of any other way to do it. The Sonoma County city of Petaluma is considering a 1% sales tax increase. They're proposing a general tax because it could pass with just over 50% of the vote. A tax used for more specific purposes would require a 2/3 majority. "The city’s $39.5 million budget for 2014-15 shows a general fund growth of about $2.7 million, thanks to increasing sales tax revenue from a slew of major retailers opening. But Petaluma still faces a major general fund deficit by 2017 — mostly due to rising employee pension and health care costs." Coming to your town soon? Nope. It's already happening in Eureka and any number of other cities and counties across the state. "The road is just awful!" The title paraphrases a comment Julie Timmons made about Highway 101 in her most recent blog post. She also wrote it seems to get worse year after year. That was not the first time I've heard this sort of thing. I can't count the number of times I've heard complaints about roads in the state- both local and statewide. I just don't get it. I've driven 101 from San Francisco more times than I care to remember and the road has seemed in pretty good repair for the most part. An easy drive (at least until you get past Cloverdale) except for the burnout from driving so long. Anyone else have any particular beefs about 101 south to San Francisco? Not picking on Julie. I've just heard this enough times to make me wonder if I've been missing something. The Silver Bullet For Clean Water? Popular Science magazine is reporting on an invention that might have huge implications for water starved areas of the world. Well, maybe not water starved, as it doesn't really create water. Vapor compression distillation machines can filter out clean water from just about dirty water source: sewage, seawater, polluted river water or whatever, or so the inventor claims. They've already deployed the "Slingshots" to Africa. They're looking to spread them around even further with the help of the Coca Cola Company. I'm surprised this hasn't gotten more press, or did I miss it? I'm wondering how effective they are with seawater but, more importantly, how much do they cost to buy and operate? Current desalination technology makes it pretty much the most expensive way to get potable water. If these machines are more efficient and less costly to manufacture and operate, might this be the silver bullet we've been searching for to make desalination practical? Inner- Office Politics Go Viral? The North Coast Journal has yet another report on Eureka City Hall's sordid affair over a leaked memo. I wrote elsewhere a week or so ago I wasn't sure what the big deal was. This just seemed to me a case of inner- office politics making the news. After reading this second report, I'm not sure my mind has changed much. What seems to have happened is past city manager, Bill Panos, sent a memo to the city council detailing his plans for reorganizing city agencies. The way I read it, there's an implication that some city employees might have been reassigned, if not let go, under the plan. The memo was supposed to be read just by city council members, but one of them let the city attorney, Cyndy Day- Wilson, see it. She is alleged to have let at least a couple of other city department heads see it and then asked at least one of them to say she didn't show it to him. Sounds kind of tacky. We all appreciate people being able to keep things to themselves and attorneys, of all people, are supposed to be discrete. It still seems mostly like regular office goings- on to me. The accusation of asking others to lie after leaking what was supposed to be a confidential memo does seem a bit more serious. That the memo was supposed to be so confidential it had to be kept secret has me concerned. I realize this involves "personnel matters", but it seems the people involved in those same personnel matters weren't being given information that directly involved them. Doesn't sound like very open government to me. I wonder if it couldn't be argued the city attorney was acting as more of a whistleblower in showing the memo to others? Perhaps a lack of discretion on her part, but didn't the other city employees have a right to know at least something about plans being made involving them? I was surprised this story on volcanic activity in the Antarctic contributing to glacier melt made Yahoo News. Believers can relax. They included the obligatory mention of global warming. One thing I've been wondering for a while is how much heat the earth itself generates? It's supposed to be super hot in the center of the earth. Some of that heat must radiate towards the surface, never mind the subterranean magma flows we know about. I'm wondering if whatever heat the earth gives off is constant, or does it go up and down? Does anybody measure this sort of thing? Fun Sunday reading for those of you that enjoy historical mysteries. This story about Hitler not dying in the Berlin bunker has some items I'd never seen before. I'd missed this story from The Guardian about DNA test taken on Hitler's supposed remains that claims they couldn't be his. This link here takes you to a whole bunch of FBI documents regarding the search for Hitler. One person in particular, along with some others, claim he ended up escaping by submarine to Argentina. I've heard that one before. Two submarines were involved, so the fellow says. Whole bunch of documents there. The handwritten ones are hard for me to read. The typed ones only a bit less so, especially with all the names blacked out. Might be interesting for mystery buffs. It is to me, but I have a hard time dismissing the eyewitness statements from those present in Hitler's bunker the last few days and hours that say he killed himself. As far as the DNA evidence, maybe the Russians dug up the wrong body? And what about those supposed two submarines used to sneak them to Argentina? Wouldn't some of the crew have told their story? Addendum: As an aside, one thing that always puzzled me is how just dousing someone with gasoline and setting them on fire would destroy as much of the body as is being claimed happened to Hitler. I understand it takes hours to cremate a body at 2000 degrees in a crematorium. If they just poured gas on Hitler and lit him on fire, seems to me there would have been a lot more left when they found the remains. "Has anyone commented on the fact that the recent events in Iraq make the U.S. and Iran de facto allies, both opposing a Sunni uprising? Or that the the U.S. and the militants we oppose in Iraq are de facto allies against Assad's regime in Syria, a semi sort of maybe Shia regime supported by Iran?" In other words, Syrian Alquada/AlNusra good, Iraqi Alqueda/AlNusra bad. "... when Anthem was preparing to roll out its Covered California plans it took a hard line negotiating with local doctors, offering reimbursement levels 65 percent lower than for its traditional plans." My understanding, just from what I read in the news, is that's not quite right. I read that the insurance companies had to provide reimbursements comparable to MediCal/ MediCare in order to participate in the Affodable Care Program. MediCal/MediCare and CMSP have long been known to be among the lowest reimbursement rates in the country. I also read that as part of ACA those payments were at first reduced even further. Might that be the reason the insurance companies offered such low reimbursements in the first place? If that is the case, I'd hardly blame that on the insurance companies. The article started off by suggesting the insurance companies falsely claimed a number of doctors and medical services were amongst their "in- network" providers. I'd heard about that early on but can't vouch for it as neither the official California Affordable Care Act web site or the Anthem Blue Cross web site list of in- network providers worked for me. No matter how many times I'd try it they came up blank. Last time I tried it a month or so ago the Anthem Blue Cross list still comes up blank. I'd hardly call that fraud, just a mess. Addendum: Just came up with a possible reason for insurance companies listing in- network providers that turned out not to have been. Might it be that they listed providers that already accepted regular Anthem Blue Cross but didn't take into account those same providers might not accept Obamacare mandated reimbursements? I wrote here earlier of calling Redwood Family Practice to confirm they accepted Anthem Blue Cross. They said they did. I called them again after hearing they might not accept those under ACA/Obamacare. They said they accepted and processed all ABC claims in the same manner, but whether they continued to accept the Obamacare policies depended on what the reimbursement rates ended up being. It could have been because of confusion over accepting the rates. I just found out yesterday was National Iced Tea Day. I drink iced tea just about every day so I suppose it's no big deal that I missed it. David Friedman finally gets back to his critiques on global warming/ climate change. His Hockey Stick Question post looks at whether it makes sense to combine tree ring data and temperature readings to evaluate warming trends. In Global Warming and Wishful Thinking he looks at how people's political views might affect their views on global warming. Comments to both posts are worth a read as well. Interesting story in the Lost Coast Outpost from a local pot farmer on his mandatory minimum sentence for growing. I'm surprised at the negative tone of many of the comments to the story, although I guess it's true: Play with fire and you might well get burned. His narrative is no surprise to me. I've heard the details before. I saw one of those cop reality shows some time ago where they followed Drug Enforcement Agency agents around for a night of raids. They'd make one small time drug bust, get the suspect to "rat" on the next guy, go get him, he'd rat and they'd go after the next guy up the ladder. As I recall, all but one guy ratted so most of them pretty much walked. The guy who didn't rat I don't remember them following up on. He just said he wasn't saying anything and that was the last you heard of him and the end of that night's episode. We thought the computer was fixed but the problem re- occurred. It worked fine after we brought it back Thursday and all day Friday. Saturday morning I turned it on and the monitor just flickered. I tried turning the power off and on. Nothing. At least Cornerstone Computers was open Saturday's from 10 to 6. I was bummed having to go back in there, never mind having the computer down again. Drove over to their shop and apologized for them having to see me again. I explained the problem. They told me to go ahead and bring it inside and bring the monitor, too, if I had it. I had brought the monitor this time. They also told me they did some stress tests on the video card when I'd taken it in earlier and nothing seemed wrong. I left it there figuring I might not hear from them until at the very least Monday. I'm worried this could end up costing the $200.00 plus I thought it might cost earlier. I get a call from them around 4pm saying they've run both the computer and monitor for some time, turning it on and off, plus a diagnostic on the monitor and it's working fine. They can't find a problem. He did suggest that perhaps the whatever-it's-called adapter that adapts the monitor cable to the video card might be defective. A long shot, but who knows? I drove back to Cornerstone. They put the tower and monitor back on the table and started them up. Everything worked fine. How weird. I went ahead and bought another of the connection adapters just in case that might be the problem, or part of it. Only $6 and change, so no biggie. They didn't charge me for any of their diagnostic work earlier in the day. What a bunch of guys! They very well could have. Brought the computer home, hooked it up with the new adapter and it booted right up with the monitor working fine. Same thing this morning. Who knows what it will do next time? If it does it again, I figure next step is to buy a new monitor. If that doesn't fix it, then it's time for a new computer. While you're filling out the North Coast Journal's Best of Humboldt 2014 runoff quiz, please join me in voting Cornerstone Computers as best computer store. After doing that, if you've been to Cornerstone Computers, be sure and give them a good Yelp review as I and some others have. Can't vouch for these guys but they're advertising on Craigslist that they'll haul off metal stuff like old cars and motor homes for free. If you have neighbors with a bunch of junk laying around their yard that's an eyesore, maybe point them to this ad and they'll get rid of some of it. Back to using my regular computer now after a couple days on the laptop so thought I'd plug Henderson Center's Cornerstone Computers. I've been real happy with them in the past. This last time might seem pricey for what was done, but they could have taken me to the cleaners had they wanted to. A few days ago I thought my monitor was going out for reasons I won't describe here. After a couple days it seemed it had gone out so I switched to the old CRT monitor that worked fine when it was last hooked up. It didn't work either. At that point I was thinking the video card might have failed, even though the card was only a few years old. So I took the tower to Cornerstone and explained the problem. The guy told me it might just need a good cleaning. I was skeptical of that as when it overheated before the symptoms were different. I took care of that issue myself after Cornerstone pointed me in the right direction. The guy also told me they had a tiered diagnostic fee system I hadn't heard of in prior visits. It was something like $100.00 for one day service. $75 for guaranteed two day and $50 for three to four day. Something along that line, anyway. I thought it an interesting way to do it and glad to have the time option. I chose the two day. He went on to say if they needed to replace the video card it would be the cost of the card ($170) plus labor charges I don't recall. I was thinking it might well end up being $250 or more, yet another large expense we could ill afford. But, I needed the computer fixed. The two days went by and we hadn't received a call by 4:30pm, although Connie said someone called around noon but didn't leave a message. So I called them and the girl said there must have been a mistake because my computer was ready to be picked up. All it needed was all the dust cleaned out, especially from the CPU. That was causing the overheating. Total cost: $60.00. That may seem like a lot to some, but I was relieved it was only $60.00. They could have went ahead and replaced the video card just to sell the card, but they were on the up and up and just fixed the minor problem. I've taken my tower in there at least a couple other times and have been just as satisfied. They also sell hardware like modems and monitors at competitive prices. Nice to have a place like that just blocks away. I highly recommend them. Corner of F and Henderson Streets in Eureka's Henderson Center. I've always enjoyed Matt Owens' Matt In The Middle commentaries on the Lost Coast Outpost. His most recent one seemed a bit tacky to me. Maybe it's just the title, Four More Years!, that set the tone, and I don't know that he's the one that came up with that. I'm not saying his observations aren't right but some of them come off as almost as rude to me. When he does a breakdown winners and losers, it's as if he's gloating over his victory and kicking someone when they're down. Not a good idea, Matt. You might well piss them off and get them more riled up for the next election. It's often best to enjoy your wins quietly and, if you are going to gloat, do it amongst like minded people. Kinda strange thing happened yesterday morning. I'm wondering if it's legit? Guy knocks on my front door. Wife answers the door and begins talking to him. Sounded interesting so I go to the door to see what's up. The guy hands me what looks like a business card, but has no name on it. It's from KCHP 97.1 FM. The card says it's Humboldt's local christian station. He goes on to say their Arcata based station was getting bad reception in my neighborhood so he came to investigate. He says the bad reception seemed centered around my house so he drove around looking and noticed the old citizen's band radio antenna I have up in the chestnut tree. That antenna has been there for probably 20 years or more and it's not even connected to anything anymore. He claims it's interfering with their station's transmissions. He didn't exactly say to take it down. He just cited the same thing happening up the street some time ago claiming they didn't take their antenna down so the Federal Communications Commission came and took all their equipment. I didn't think much at first, but I wonder if that isn't a bunch of bs? First of all, this is the first I've heard of my antenna interfering with radio signals after all the years I've had it up. Second, I have a hard time believing the FCC would go around hassling people over a small time, low power radio station- I notice their web site specifies "Internet Radio"- much less tell people to take an antenna down that's not even being used for transmissions. But, now that he brought it up, I thought I would take it down anyway. He seemed like a nice guy. I'm just wondering if he's full of crap? Anyone heard of anyone else being hassled over an unconnected radio antenna interfering with semi- commercial broadcasts? Too many mailers. Maybe not so bad this time around. We got quite a few from the Bass campaign. Only one from Kerrigan. It's like they think of mailers as shouting and that if they shout at me loud and often enough I'll vote for the candidate. Rattling off endorsements during candidate forums. Nothing wrong with putting whatever endorsements you have on a campaign page or a mailer. Endorsements- and who is making them- tells me something about the candidate. It still seems cheap to rattle off a bunch of names in candidate forums, televised or not. Two candidates come to mind this last time. Mike McGuire, running for state senate, rattled off a bunch of big names at the end of the League of Women Voters' KEET TV forum. He's the last guy I'd vote for in that race and the names he gave were ones I pretty much loathe anyway, with some exceptions. Seemed tacky, regardless. Virginia Bass, who I voted for, did the same thing. She rattled off many of the same names McGuire did. Yuck! It just seemed cheap to throw that out at the end of the forum. Maybe it's just me? Robocalls. Yep, I hate them too. I don't recall getting any this time. Hope it stays that way. As if I'm actually going to sit there and listen to the whole recording? Read some letters in the Santa Rosa Press- Democrat recently stating they won't vote for candidates that send out robocalls. That's something more candidates, and voters, might consider. Signs. I'm a little annoyed by campaign signs despite being one who often puts them in his own yard. Nobody seems to know what I'm talking about when I say they're like people yelling at you as you drive by: "Vote for Kerrigan! ", "Vote for Bass!". I just get blank stares whenever I bring that up. Signs do have their interesting side. You get to know who some of the flakes are in your neighborhood by the signs they have. I never realized how many flakes live near me until the last few weeks when I saw all the Kerrigan signs up. If you didn't take your signs down last night. Please go do it now. The Santa Rosa Press- Democrat reports the Healdsburg City Council has agreed to put the city's 60 year old practice of water fluoridation on the ballot in November. Some on the city council feel the city should provide an argument for continuing the practice. There seems to be more than enough residents opposed to provide the argument against. A question: Should the city provide the argument in favor of fluoridation if there aren't any residents willing to get together and make an argument of their own? Maybe so. Nice to have two sides presented, but something about the city making the argument rubs me the wrong way. This will be interesting depending on the outcome. I'll be happy if the anti- fluoride forces prevail, but what exactly would that mean? Is it a victory for individual choice, the supposed science being touted against fluoridation, or both? I got my usual Election Day e-mail this morning asking for predictions on the outcome. I've wrote here before I don't do that. Don't see much point in it. About the only thing I'll predict is it's likely something bad will happen. It nearly always does. Hank Sims has some well thought out predictions over at the Lost Coast Outpost. And, no, I won't be staying up following election returns, either. Elections signs should come down as soon as the polls close. Cola For The Real Young'uns? This is one of those things that show up on my Facebook page every now and again. I'm getting to wonder if it's a spoof as I don't recall ever seeing an ad like this when I was younger. Maybe it was before my time? "Not soon enough. Laboratory tests over the last few years have proven that babies that start drinking soda during that early formative period have a much higher chance of being accepted and "fitting in" during those awkward pre- teen and teen years. So do yourself a favor. Do your child a favor. Start them on a strict regimen of sodas and other sugary carbonated beverages right now, for a lifetime of guaranteed happiness." Reads like a parody to me, but maybe back in the day maybe they did run ad like this? 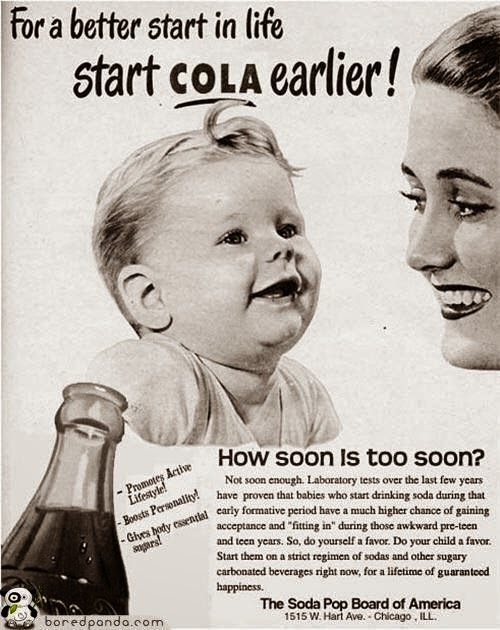 Just received this comment from the FB page I saw this on: "I believe it's a touched up photo, as in those years, little ones were not allowed to drink coke, let alone advertised to children to drink coke.". She makes a point. This looks to be circa 1950s to 60s. Didn't Coca Cola have actual cocaine in it back then? The Times- Standard reports that the rodent poison D-Con will be taken off store shelves by July 1. I'd link to the story but won't since the T-S site screws up my browser. I'm assuming it does the same to others? This is the result of California pesticide regulators trying to ban the poison. The reason being non- target animals being killed. The article says 300 animals killed nationwide(?). I read 400 in a story somewhere else. To be fair, it's likely much more than that. Still, just a few hundred nationwide? Probably thousands get run over by cars every day. Funny thing is, I understand D-Con was brought into use as a substitute for more toxic poisons. I was told by a pest control guy years ago they used to have stuff that would kill a rat after one bite. That stuff was deemed too dangerous. Perhaps rightfully so. At least with D-Con it takes a while for it to kill, so dogs, cats or kids could be treated after accidental ingestion. I guess that's not good enough for some people. I've been placing D-Con under my house for at least a decade. We've had rat problems here for as long as I can remember, even when we had three cats patrolling the yard. I've never been aware of a non- target animal killed or sickened through my use of D-Con. It does seem to keep the rats at bay, though. I'll leave trays out and notice something start feeding, then they stop. I'm sure the rats crawl off and die somewhere. I've only seen one dead rat in all that time and it was a big, black furry Norwegian Rat out near our raised beds. Our cats never touched it. So what to do now? First, I'll go to Shafer's Hardware and buy a couple cases of D-Con while it's still available. That should last at least a year. After that, I'll try the substitute they're supposedly making available. If that doesn't work, who knows? There's always the old fashioned rat traps, but that would take a full scale effort to keep rats at bay- when you see one, there's usually a lot more. I was just looking for info on the trick of using chewing gum to kill rats. Supposedly they eat the gum and it plugs up their guts. They can't process food so they die. From what little I've read so far that sounds like it might be one of those old wives' tales. Be interesting to see if we have any major rat infestations crop up in the state. I won't be surprised if we do.